I love revisiting books at different times in my life. Perspective is so weird. The last time I read this series, it was before I joined Goodreads, and way before I started reviewing books regularly, so it took me a minute to put my thoughts together. 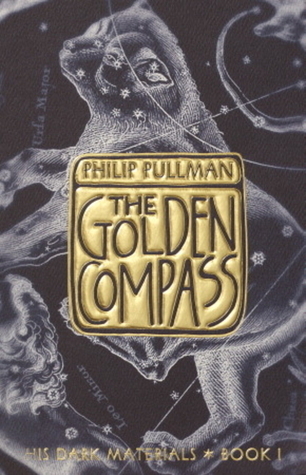 I’d never read this book critically before, only with the half-frightened fascination a kid has for something they find intriguing but don’t really understand, and then again when I was older, to try and relive that feeling. When I first read this book a year or so after it was published, it scared the hell out of me. It was so creepy and adult feeling. I had no idea it was meant for younger readers until I was already an adult; my copy was this mass market paperback edition, which doesn’t exactly scream, HEY KIDS, READ ME, although I did pick it up at the Scholastic book fair. The themes it was dealing with—unreliable parents, religious fear, theological experimentation, the loss of innocence, and above all, questioning authority—weren’t things other books I was reading were dealing with, at all. Lyra grows up wild on the streets and rooftops of Oxford. She lives at Jordan College, in a world very like ours, with technology about a hundred years behind, only every person in her world is born with a dæmon, an animal companion that holds a part of that person’s soul. Her parents supposedly died when she was a baby, and she has shelter and a piecemeal education from the Scholars of Jordan, when they can corral her. 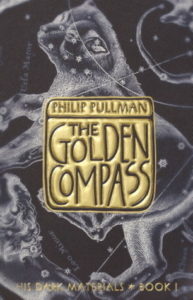 When, on a visit to the college from her Uncle, Lord Asriel, she prevents him from being murdered, she is drawn into a conspiracy involving the church (in this world called the Magisterium, which exercises immense control over the government), missing children, and something called Dust, which no one seems to understand, and everyone seems to be afraid of. Along the way she rides in fleets of river boats, meets witches, makes friends with an armored bear, and comes face to face with horrors that make her stomach turn. Lyra is brave and sneaky, curious and stubborn. She happens upon adventures where complex things are happening with the simplest motives: to rescue her friend Roger, to be compassionate, to help. What I’ve always liked about Lyra is that she’s so flawed. As her name might imply, she’s a liar, but a good-hearted one, and now that I’m older, I can appreciate the novelty of having a Chosen One protagonist swept up in that kind of story, who has no idea that she is Chosen for anything. She learns by the end of the book to question everything, and in the betrayals she experiences at pretty much every level, learns that trust is not owed to anyone who hasn’t earned it. Lyra trusts and loves those who have proven themselves to her, and mistrusts those who haven’t, deservedly so. The bad guys in this story are the people who prey upon trust given to them freely and unearned. The church and Mrs. Coulter prey upon the poor children, and their poor families, who have no power to stand against them. The government uses the allegiance owed to it to commit foul deeds in the name of fear. Adults over and over again use the trust children naturally have for those who are grown, against them. And Lyra’s parents use the love of their child to manipulate her for their own ends. The controversy surrounding this book was always focused on its anti-religious properties, but I think that completely misses the mark. It’s not just our religious authorities that should be questioned, but everything and everyone. The lesson Lyra learns is that in the end we don’t owe allegiance or trust to anyone, simply because they have power or authority, and that anyone who expects automatic, unthinking obedience should be treated with the opposite. It gives new meaning for me, that the device at the center of this book is one that Lyra carries around with her, and that only tells the truth. I’m very glad to say that this book more than held up for me, and those feelings I had as a kid while reading it even came back for a little while. This book is still creepy as hell. And I forgot how it ended! What a way to end a book, what a stab in the heart. Share the post "I love revisiting books at different times in my life. Perspective is so weird." “Perspective is so weird.” So true! Now I want to go reread some middle school favorites. It’s always so heartbreaking when you figure out your middle school self had terrible taste and/or dumbness, though. I’m glad this one held up for you!